A French-Canadian Fave With a Twist | Mealtime | Kids VT - small people, big ideas! A few years ago, I decided to put a waffle-y spin on different dishes from around the world. I made taco waffles, pizza waffles, curry waffles and more. My family's favorite? Poutine waffles. Poutine is a classic Québécois comfort food made up of French fries topped with gravy and cheese curds — the solid part of curdled milk that's sometimes referred to as "squeaky cheese." I didn't grow up eating poutine, but came to know it through my husband, who has a French-Canadian background. As soon as I tasted the savory dish, I knew that it was something magical. This spin on poutine starts with a thin waffle made with potato batter. 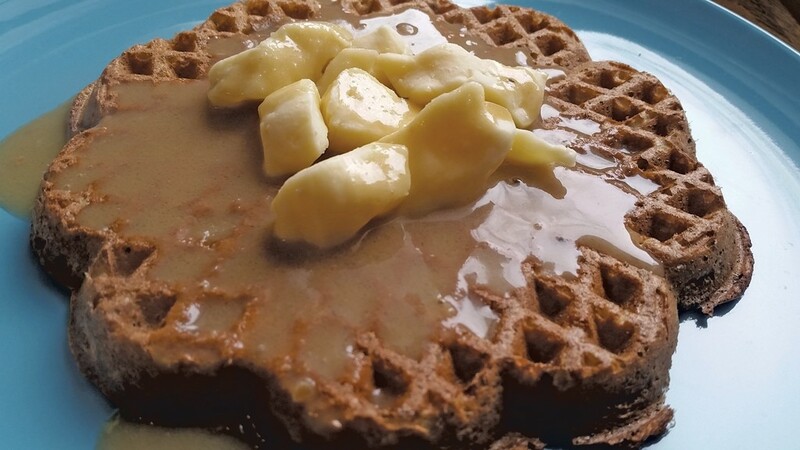 Waffles are a great base for the poutine gravy because of their nooks and crannies, but if you don't have a waffle maker you can make the batter into pancakes instead. Sometimes cheese curds are hard to find in stores. I use Cheddar Bites from Bennington-based Maplebrook Farms. They don't have the "squeak" of some other cheese curds, but they're still delicious. Try this recipe for brunch — or dinner — this month. Your stomach will say merci! Peel potatoes and shred in a food processor or with a cheese grater. Combine the rest of the waffle ingredients in a blender or food processor. Blend until a batter forms. If there are a few chunks, that's okay. If the batter is very thin, add a little more flour. You want it to be pourable, but not drippy. To make the gravy, melt the butter in a saucepan over medium heat. Whisk in the flour, making sure to smooth any visible lumps. Continue whisking and cook over medium heat until the mixture starts to turn a light brown, about five minutes. Turn heat to medium-low, and slowly stir in the broth, Worcestershire sauce and seasonings, and whisk until smooth. Turn heat up to medium-high and bring to a boil, stirring constantly until the mixture thickens, which should take about five more minutes. Cook waffles in your waffle maker, at the highest setting, until they are nice and crispy. Top with gravy and a handful of cheese curds.